Police and Crime Commissioners will have extensive powers to set local policing priorities. Stonewall research shows anti-gay hate crime remains a serious problem in every police force area in Britain, with one in eight gay people saying they’ve experienced a hate crime or incident. Seven in ten gay people say they didn’t report incidents, a third of whom didn’t think the police would take them seriously. Stonewall works closely with police forces across Britain to help them work more effectively for all people in their communities, and will engage with newly elected Commissioners to make sure they understand and respond to gay people’s concerns. UK’s Lancashire Police Constabulary have awarded their equality and diversity officer for his work on LGBT issues within the police. Police Constable Ian Ashton received a Regional Commander’s Commendation award presented by Chief Superintendent James Lee. ‘I am extremely proud to have received this and it supports and endorses Lancashire constabulary’s work around LGB&T,’ Ashton told Gay Star News. The commendation was awarded for Ashton’s work on national and local LGBT issues. According to Chief Inspector Ralph Copley, Ashton is the co-chairman of the constabulary’s LGBT staff support network and works regularly with the diversity team at police headquarters. A former detective has told a tribunal that the Metropolitan Police Service warned him against using gay dating app Grindr. Kevin Maxwell, 36, is suing the Met on grounds of racial and homophobic discrimination. Mr Maxwell claims officers were told at a briefing that their activity on social networking sites was being monitored and he was specially warned about Grindr. “Clearly this made me feel uncomfortable,” he told the Central London Employment Tribunal this week. The 36-year-old also claims to have been taunted on a police forum by colleagues saying he should become “a hairdresser or cabin crew”. Mr Maxwell, who lives in a hostel in Kings Cross, north London, served within the Met’s Special Operations Counter Terrorism Command and was signed off work in 2009 after being diagnosed with clinical depression. He started proceeding against the Met in May 2010. Mr Maxwell won a previous discrimination case against the Met in January 2012. An employment tribunal found the Met responsible for 44 counts of harassment and discrimination against Mr Maxwell. Most of the findings were upheld on appeal. The Metropolitan Police denies the allegations and the tribunal, which is expected to last 10 days, continues. 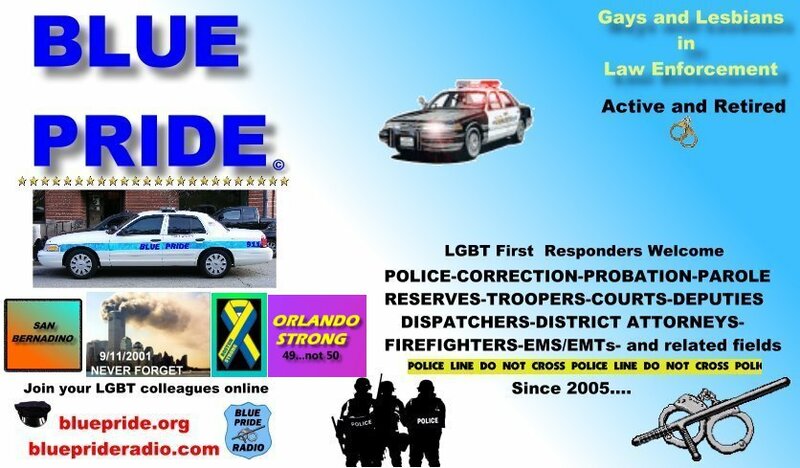 While there's no excuse for any homophobia, it's pretty much standard procedure these days for Police Departments to warn their members to stay off of or be very cautious about....using some of the various social media out there. In a lot of cases it could come back to bite you....and not in a good way. A Chief Constable stunned the audience when she took to the stage at a community event – and came out as GAY. Suzette Davenport, who is head of Gloucestershire Police, revealed the secret while addressing a crowd at the county’s gay pride day. Her admission the audience stunned but cheers and applause son broke out as the 51-year-old admitted her sexuality had left her the victim of hate crime herself. She said: “It is not tattooed on my forehead but I don’t hide it either. “I could have stood up and talked about facts and figures but people would have switched off. Instead I thought it would be better to talk about something more personal to me. “The police have made significant progress on these issues and we are much better than some public sector organisations but there is still some room to improve. “We have low levels of hate crime in Gloucestershire too. “They are significantly below the national average. Ms Davenport made the revelations at the Gloucestershire Pride Day on June 14 which saw hundreds of people march through Gloucester before assembling in Gloucester Park for an outdoor concert. Andy Harley, from the Gloucestershire Pride committee, said: “Just when we thought it wouldn’t get any better, we got to the park and she came out on stage. “We never expected that. It was incredibly brave for someone in her position. Ms Davenport had already won over participants in the march after rolling up her sleeves to direct traffic in the city centre. Eye witnesses likened it to the Gaviscon TV advert which sees a policewoman command the traffic with the soundtrack of ‘What A Feeling’. Andy added: “It was incredible. She just leapt out of the march and took on the traffic. Chris Marsh, bar manager at gay venue The Westgate, in Gloucester, said: “People were really impressed with her coming out on stage. Good for the Chief Constable! I love that they put the word Lesbian in capital letters! Adds a bit of spice, huh??!! As a kid, Tad Milmine was bullied by a hostile step-mother, ignored by a drunken father and banished to the basement of the family home in Cambridge, Ont. School wasn’t any better. After running away at 17, Milmine struggled with his confidence and sexuality. Now, in the job he always wanted, the openly gay Calgary police officer is promoting Bullying Ends Here, a program of hope, writes Allan Maki. I’d come home from school and go right to the basement, and it was a real basement with concrete walls, no TV, no radio, just a bed. Sometimes I’d be allowed to come up for dinner, most of the time it was left at the top of the stairs so I’d eat it in the basement. … I remember two boys once followed me after school. They kept calling me names. When I got home, I said, ‘Okay, I’m safe.’ I could hear some fumbling around on the porch area. Eventually, I went upstairs. The two guys were gone but I could see the glass screen door was all covered in spit. I didn’t want my stepmom seeing that because I would be the one blamed for it. How did you end up becoming a police officer? After I ran away from home and got my own apartment, I was working in retail and restaurants and it was just a fluke encounter that at 32 years old I met someone who was a police officer. I remember saying that was my dream. That’s when he said, ‘Have you ever tried? Why wouldn’t you at least try because you have nothing to lose but potentially everything to gain?’ So I did. I applied. I ended up being hired by the RCMP in Surrey, B.C. You left the RCMP last year. Was it because of your sexuality? I was not out as a gay man when I applied. It was two years into being a Mountie that I did. … Leaving was about my [anti-bullying] program. I was doing it on my own time at my own expense. I was served a document from the RCMP – eight pages – that was basically a cease-and-desist order saying I had to stop immediately. Shut the website down. No more e-mails. No more presentations until I could meet all of their demands and then seek the approval of the Human Resources officer. I explained that was not possible and that I was going to keep going with the program. It was very business-like; there was no yelling, no insults. I quit. Obviously, a huge door opened and presented me with a chance at joining the Calgary Police Services. Have you experienced any abuse from your fellow officers? Not at all, not once. I’m aware of the stereotypes out there, especially in this line of work. I thought there was going to be locker-room challenges. There were going to be jokes. The reality is there isn’t, and I only speak from my own experiences because I’m not naive to say it never happens. When you do your Bullying Ends Here presentation in schools, what do you say to the students and what do they say to you? I tell them I received 15,000 e-mails last school year alone and I respond to every one myself. Hundreds of those e-mails are from self-confessed bullies and they’re saying they don’t know how to stop. They say, ‘If I stop, I’m not going to be on that pedestal. I’m going to lose my status within this group.’ That reflects what the program is about. It’s all of us, together.